For the second year in a row, AT&T's LTE service has proven to be the fastest in our survey of wireless broadband performance across the United States. T-Mobile LTE appears to be spreading rapidly, and is pumping out high speeds. Verizon LTE is reasonably quick and easily the most pervasive, while Sprint LTE lacks speed in urban centers. Those are the top-line findings of our most recent study of real-world wireless broadband performance in America. In March and April, we measured the LTE services of the four major national wireless carriers in 20 cities from coast to coast. A quarter of U.S. cellular subscribers now have LTE service, and analysts expect that number to grow to nearly 70 percent in 2017. More and more new phones will bear the LTE label, and phones that connect only to 3G service will become increasingly rare. In fact, 3G networks were originally designed for voice, not data. The carriers retrofitted them with IP technology to make them convey data, but you can retrofit only so much until returns (in speed and capacity) begin to diminish. New LTE networks are constructed from top to bottom with IP as their main language, so they are far faster, more economical, and more flexible than the clunky old 3G networks. But 4G is very expensive to build from the ground up, as investors in the Big Four wireless carriers can attest. The advent of the iPhone and then Android phones—plus their insatiable hunger for bandwidth—caught the carriers by surprise. Since then, the carriers have embraced the high-margin business of moving mobile data, and have invested billions in upgrading old networks and building new ones. Somewhat ironically, it is the carrier that was originally (and very publicly) stung by the mobile-data crunch that now leads the race for faster data speeds. About 30 percent of AT&T’s smartphone customers now use an LTE device, the company says. AT&T tells its customers to expect the same upload and download speeds from its LTE network as Verizon does, about 5 to 12 megabits per second for downloads and 2 to 5 mbps for uploads. AT&T delivers a bit more, pushing the high end of the download range and exceeding the upload range. In our tests, AT&T’s network averaged download speeds of 13.15 mbps, and 6.45 mbps for uploads. We saw average download speeds of above 15 mbps in six cities: Boston, Denver, Las Vegas, San Diego, San Jose, and Seattle. The average speeds in two of those cities, Denver and San Jose, surpassed 21 mbps, marking the only 20-plus-mbps showings of any service in our study. 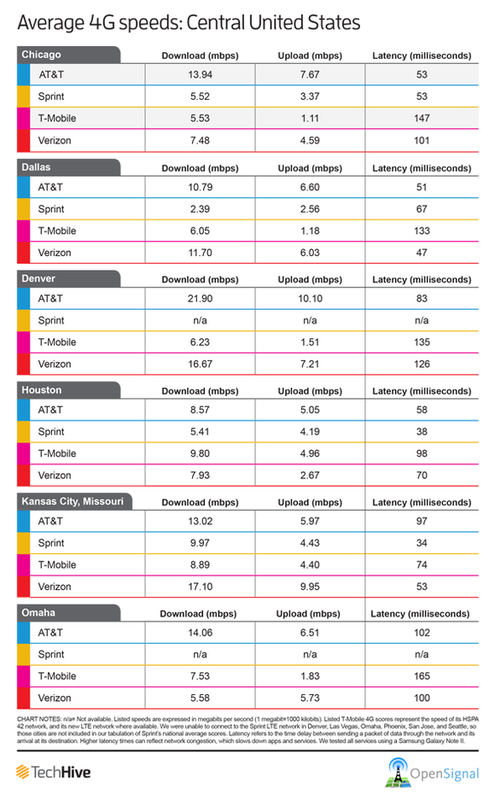 AT&T LTE clocked average download speeds of greater than 10 mbps in 16 of the 20 cities we tested. AT&T’s average upload speed dipped below 5 mbps in only four cities: Ann Arbor, Atlanta, Los Angeles, and New York. AT&T’s fastest city for uploads was Denver, with an impressive average speed of just above 10 mbps. At that rate, you can upload a 7.5MB video in 11 seconds. AT&T’s 4G LTE isn’t nearly as widespread as its HSPA+ service (which the company markets as 4G service), and customers’ LTE-ready smartphones default to HSPA+ when LTE isn’t available. Rival Verizon has a definite advantage over AT&T in the reach of its LTE service: Currently AT&T’s LTE network is accessible to 220 million people, while Verizon’s network comes within range of 287 million. Verizon Wireless didn’t post the fastest LTE speeds in our 20 testing cities, but it does have the largest and most robust 4G LTE network in the country. The carrier seemed to announce expanded coverage in new cities almost weekly between May 2012 and May 2013, and now offers LTE in 497 U.S. cities. LTE service is available in roughly 95 percent of the carrier’s 3G coverage area. Verizon’s contention is that although wireless speeds are important, the breadth of the LTE coverage is more critical. Verizon’s LTE speeds may not be the highest everywhere, the company says, but the network is fast enough for the tasks that mobile users want to do, and it allows them to perform those tasks as they move from the city centers out into the suburbs or less-populated areas of the country. Obviously, however, speed remains important, especially if you are a Verizon customer who wishes to do things like stream video or video chat. In recent years, some observers wondered whether Verizon’s LTE throughput speeds would diminish as more and more devices connected to the network since its launch in late 2010. According to Verizon’s most recent quarterly earnings report, 61 percent of Verizon’s customers currently have smartphones with data plans, with 28 percent being on the company’s LTE network. LTE subscribers are also using 54 percent of Verizon’s total data, an increase compared with last year. But our test results suggest that Verizon’s LTE service has been gaining speed, not losing it. Verizon’s LTE registered a healthy 9.61-mbps average download speed across our 20 testing cities, an improvement of roughly a third over the service’s scores in last year’s tests. That average speed falls comfortably within the range Verizon tells its LTE customers to expect: 5 to 12 mbps. The service’s tested upload speeds exceeded the range the carrier promises (2 to 5 mbps), clocking in at 5.47 mbps on average. We recorded the fastest Verizon LTE speeds in San Diego and Seattle, where we saw average downloads of roughly 18 mbps and uploads at a solid 8 mbps. Verizon’s scores in those cities were about twice as fast as T-Mobile’s 4G speeds in those cities, but slightly less than AT&T’s. Verizon also pumped out download speeds in the mid-teens in Kansas City and Denver. We saw the slowest performance of Verizon’s LTE network in Washington, D.C. (2.24-mbps downloads and 3.69-mbps uploads). It was also slow (relative to AT&T and T-Mobile) in Atlanta (4.81-mbps downloads and 4.10-mbps uploads) and in Phoenix (4.81-mbps downloads and 4.16-mbps uploads). Other LTE models include Apple’s iPad; Samsung’s Galaxy S III, Galaxy Note and Note 2, and Galaxy Tab; and the BlackBerry Z10. We’ll likely see more Verizon LTE customers once the carrier starts shipping the highly anticipated Samsung Galaxy S4 on May 30. T-Mobile has gotten its game on with its network in the past year. The carrier had been selling HSPA+ service and labeling it “4G,” but in April the company launched its own LTE network, which some people consider to be a true 4G technology. 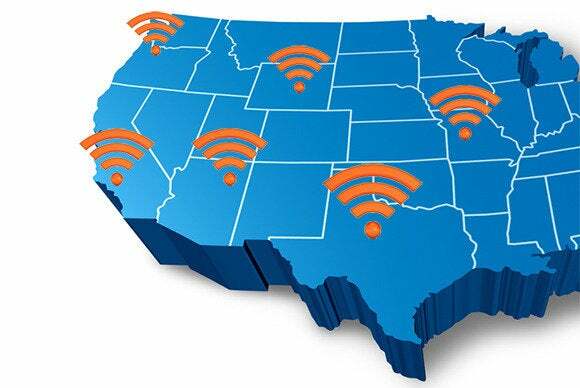 The new service is now officially available in Baltimore, Houston, Kansas City, Las Vegas, Phoenix, San Jose, and Washington D.C., though we were able to measure the signal in several other as-yet-unannounced cities. The iPhone 5 that T-Mobile began selling on April 12 is fully compatible with the LTE network, which will allow for speeds of 20 mbps or better for buyers lucky enough to live in a T-Mobile LTE city. T-Mobile has sold more than 500,000 iPhone 5 units as of May 8. The carrier says that it plans to grow out its LTE network to many more cities by the end of this year, coming within range of 200 million people. “T-Mobile’s 4G LTE network rollout is moving at a speed that’s unprecedented in the U.S. wireless industry—we’ll go from seven metro areas today to nationwide by the end of the year, with many major metros launching next month," said T-Mobile U.S. CTO Neville Ray in a statement to PCWorld/TechHive. Because of the considerable speed of the HSPA 42 service, we accepted T-Mobile’s “4G” designation for the purposes of our study, and pitted the service against the LTE services of its competitors. T-Mobile’s two 4G services—HSPA 42 and LTE—together produced an average 4G download speed of about 9 mbps in our 20 test cities. 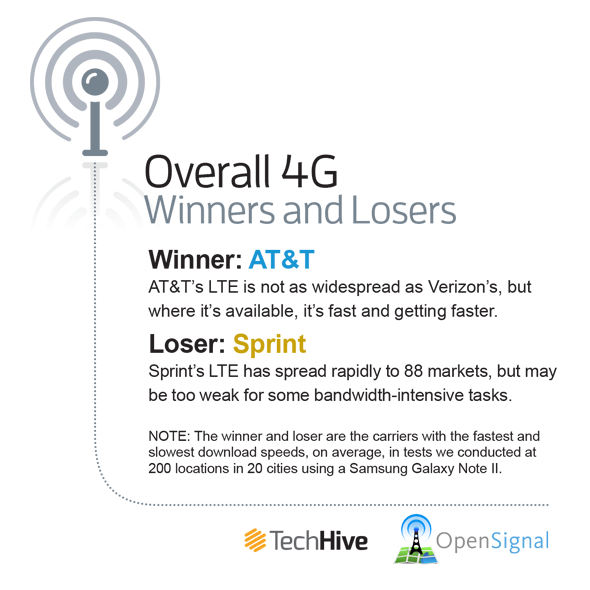 That score put T-Mobile in a virtual tie with Verizon LTE for second place in our study. Average upload speeds came in at 2.65 mbps, the lowest average for uploads in our four-carrier race. T-Mobile’s service also produced the highest average network latency time in our study, at 124 milliseconds (still responsive enough to support real-time services like VoIP). We were able to perform 653 speed tests of T-Mobile’s new LTE service in seven cities: Houston, Kansas City, Las Vegas, Phoenix, San Francisco, San Jose, and Washington, D.C. Taking those results alone, T-Mobile LTE clocked an average download speed of 14.94 mbps and an average upload speed of 6.86 mbps. We recorded a superlow average network latency of 54 seconds, which suggests a network with very few devices connected to it. T-Mobile’s overall 4G speeds improved considerably in the 12 cities where we tested in both this year’s and last year’s study. 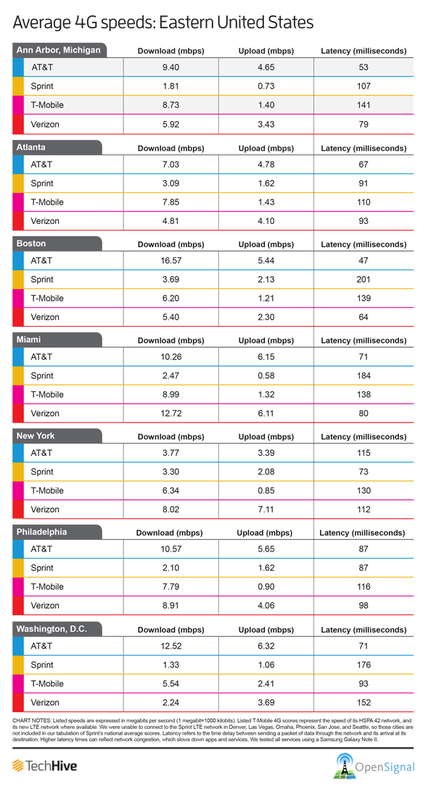 In those cities, T-Mobile’s download scores improved from 5.48 mbps last year to 8.73 mbps this year. Upload speeds improved from 1.28 mbps to 2.63 mbps this year. 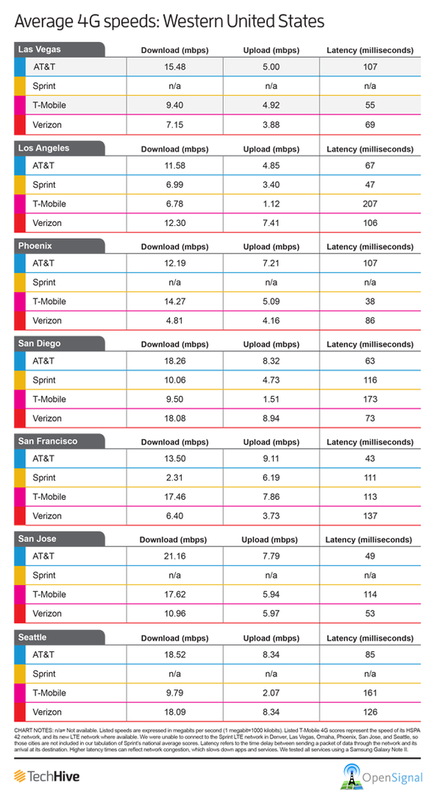 T-Mobile’s fastest cities were San Francisco and San Jose, where we measured downloads in the 17.5-mbps region. We also saw high download speeds in Phoenix, where downloads averaged about 14 mbps. In the remainder of our testing cities, however, T-Mobile download speeds failed to break into double digits. Sprint introduced its all-new 4G LTE network in July 2012 and now offers LTE service in 88 U.S. markets. Sprint says it will add another 170 LTE markets over the next few months. Unfortunately, the reach of Sprint LTE seems to be growing faster than its speed. Sprint says that it’s seeing average LTE download speeds of 6 to 8 mbps and average upload speeds of 2 to 3 mbps, but our tests recorded the network at an average of 4.32 mbps for downloads and 2.76 for uploads in the 14 cities where we could connect to the service. 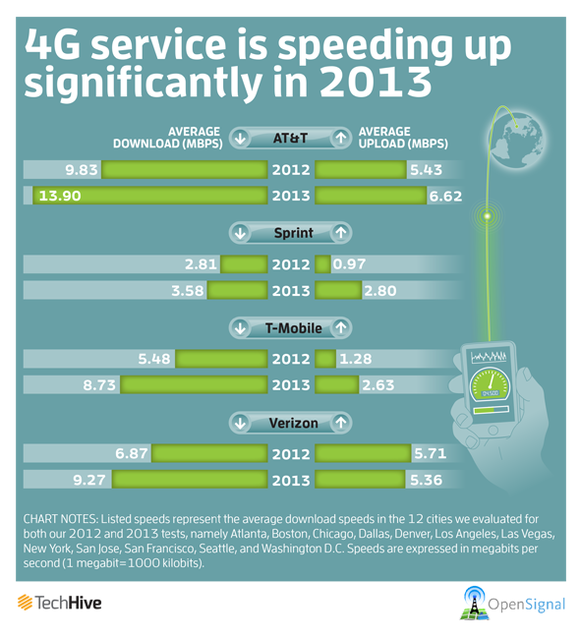 Those averages put Sprint last in our speed rankings for 4G service. 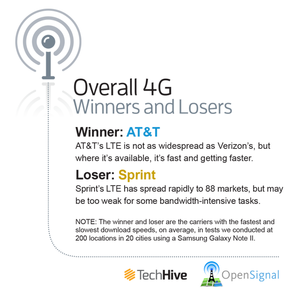 In fact, Sprint’s average download speed was less than half the speed of the third-place finisher, T-Mobile, and roughly a third of winner AT&T’s average download speed. Of our 20 testing cities, Sprint has launched its new LTE service in seven: Atlanta, Boston, Chicago, Dallas, Houston, Kansas City, and Los Angeles. But the carrier is testing the service in Ann Arbor, Miami, New York, Philadelphia, San Diego, San Francisco, and Washington D.C., where we were able to perform enough tests to generate an average score. Sprint LTE didn’t average download speeds of more than 5 mbps in any of the seven cities we tested on the East Coast. We saw the fastest download speeds from the Sprint network in Kansas City and San Diego, where it averaged about 10 mbps. We recorded download speeds averaging about 7 mbps in Los Angeles, and roughly 5.5 in Chicago and Houston. But the rest of Sprint’s city averages looked more like the 3G-network speeds of AT&T and T-Mobile. Sprint says it is building its LTE network in the suburbs first, and then moving into the city core (where we tested). This arrangement, the company says, may account for some of the low scores we saw. Sprint spokesperson Kelly Schlageter also points out that the new network is still being built. As our results show, you can find some real differences in the quality of 4G mobile broadband. “The results of the PCWorld/TechHive test clearly demonstrate that not all 4G, and not even all LTE, is created equal, with average download speeds varying by a factor of more than three times among competitors,” points out Dan Hays, U.S. wireless advisory leader at PwC. 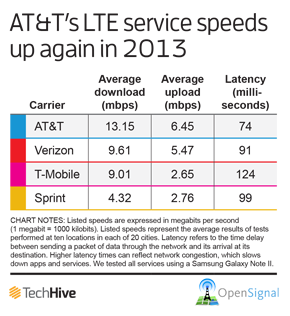 This story, "AT&T has fastest LTE service, T-Mobile off to strong start" was originally published by TechHive.